Originally born and raised in New Jersey (and does she ever give new meaning to "jersey girl"!!) 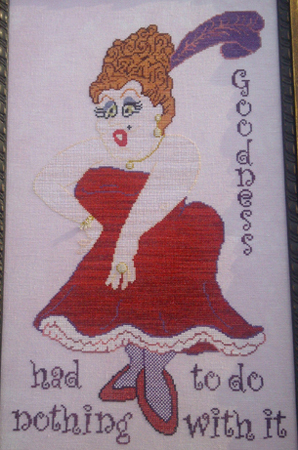 Currently riding her broom around the state of Maryland, Gail Reinhardt in her alter ego persona designs also under the Ruby Slipper Needlework Design title. Stitching since childhood she now portrays her talents through original charted designs with a wild whimsical flair. She has always loved the "Wizard of Oz" and believed that the wicked witch of the west got a bad rap, and who dressed her in black? Lets add color and denim!! "Not all Witches" flew off the shelves and was followed by "When Life Gives You Lemons" - just let me tell you about those margaritas!! With a flair for fun phrases and bright borders, under "Ruby Slipper" Gail will get a laugh or a nod to truth out of you before you even make it a conscious thought! Enjoy the style!!. * Gail's designs, ByGone Stitches and Ruby Slipper Needlework Designs, are her legacy - the copyright is owned by Stitching Pretty Ltd, they will continue under copyright and they will continue to be printed and sold through Stitching Pretty Presents! on behalf of family and friends - thank you so much for the support! One of the last pieces discovered on Gail's charting board.... but so much of her!! the proceeds from this piece will benefit a lucky textile student, courtesy a MidAtlantic Needlework Retailers Assoc scholarship, named in memory for Gail. Hannah is done on Lakeside Linen French Lilac with Gentle Art sampler threads.